Saturday morning arrived, the day before the race so as some last minute training, I knew I was going to do the Park Run again. Scott was competing in his own race that morning so I went on my own instead. I signed up to the correct Park Run this time (As I mentioned before, I had done a previous Park Run so I convinced myself I was going to go to that one again, even though it’s about an hour and a half walk away) so I was able to get a time on the website this time. When you’re standing around on your own, you do wish you had someone with you but that doesn’t last too long before you head over to the start line. The first lap I really surprised myself at how I felt my pacing was; I was a comfortable tired but not too tired that I didn’t feel like I could go on. The only killer in both laps was the last hill of each, I struggled mentally with those and took a five second walk before starting back again but it wasn’t as hard as the previous week had been. One change I made in this run was inward thinking. I have spoke to myself (inside my head) many times using positive mantras and encouragement but the times it didn’t work, I don’t think my head was in the right mindset. This run however, was very different for some reason. I lost count how many times I told myself “You can do this” and it worked. I can’t explain the feeling I had when I told myself that but normally “the other side” would say “No you can’t” but I didn’t have that on this occasion. The only thing were it was tough, like I explained in the last paragraph, was the last hill on each lap. I’m really happy I’m starting to break down that negative running barrier. When it came to the finish, I was at the point where I couldn’t push myself to go faster for the last few metres, so it’s safe to say, I was very tired but I knew it was a good tired. I had only looked at my watch one time during the run and it was coming up close to the start of the second lap so I had an indication of a rough time. So Saturday marked my first unofficial Park Run of 2017, and I say unofficial because I forgot to print out my little scanner code so I won’t get a time on the website but I don’t mind because both Scott and I recorded it individually; I recorded it on my FitBit Blaze and he recorded his on the Nike Running App. We arrived just on time, just after the little talk the volunteers give to the runners so we made our way around to the starting line and the laps themselves weren’t too different to how I had been running. The only difference was that we were starting at the western point of the pond and running down the hill to the pond towards the end which meant we had to run up the steep hill twice. The run was very similar to my one apart from those few points though, which I felt at ease with. At the very beginning I had some of the self-critical thoughts and doubts creep into my head thinking that there was no way I could do it and they seem to creep back at the exact same place for the second (and final) lap. I’m glad I pushed through the thoughts but it’s not the nicest mindset to be in, it might just take a while for that to pass, right? One thing that I’ve found is my FitBit seems to be slightly off and I had noticed this a few times but the run on Saturday seemed to confirm this. 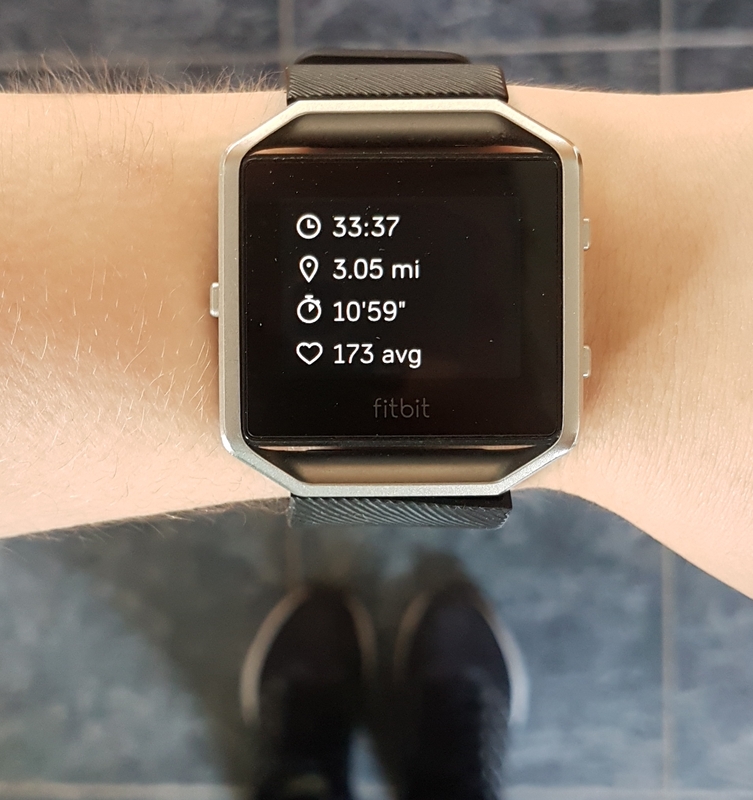 The run altogether is 5K exactly yet my watch is knocking 0.1miles off my time which is quite frustrating so if you see me posting my watch times and it only says 3.02 miles, it’s really 3.12 which is just over 5K. So what was my time? Well I’m so happy that I hit another Personal Best because Scott said to me just before the end, “You’ll be so surprised at the end.” and I said that I was preparing myself to be disappointed. When you’re running in a big group of people, because there are so many people in front of you, you feel like you’re running too slow and I always look back to that very first slow run that I spoke about so I always feel like I’m running at that speed. My time was 35:42 according to Scott’s app, and it’s almost ten seconds more on my watch because I was so happy to finish that I forgot to hit the pause button, so that’s why there’s a few extra seconds on. According to Scott, from the first run we done together, I was doing a 14 minute mile and on this particular run, my average was 11:26 a mile, so quite the drop in times! As you can see from the watch statistics, it says 3.02 miles when really it was 3.10 miles so I’ll have to see if I can fix that somehow. It syncs with my GPS on my phone so I’m not sure what’s going on with it. Training for a 5K Run: The Lone Run. So with less than two weeks to go until race day, I need to up my running game and this is my third run since signing up to the race less than a month ago. This was my first lone run because Scott had to work so I thought it would be good experience to see where not only my head would be but how far my own motivation would take me, even though on the day of the race, I know he’ll be there. If you remember back to my second race, I wasn’t in the greatest place mentally but I’m very happy to report that my head was in a much better place for this run. I described it as “losing motivation” to Scott but he said it’s more self-doubt that anything. I got round about half way of the course (I say “around”, I only checked my distance twice because I didn’t want to get too obsessed with checking it) and I felt like I couldn’t do the full distance. I added a few more hills into this run than previous two so I felt the extra challenge of those and I think those were fuelling the self doubt. Running on my own definitely wasn’t as lonely as I thought it might be. I’m quite used to my own company anyway but I thought since I was in a public place, I might feel it more but surprisingly I didn’t. I had my music playing throughout so I didn’t feel like I needed conversation because of that. Something that I’m still struggling with is my breathing; it might sound silly but controlling your breathing while running is quite challenging. Thankfully because I have my headphones on, I don’t hear the very heavy breathing noises but if I didn’t, I don’t think I would be able to hear myself think. As you can see with my FitBit above, my numbers were thirty seven minutes and forty eight seconds. As with the second run I ran a little further than the 3.1 miles so if you scale my numbers back to exactly the miles to match 5K, I would have completed it in the thirty six minute mark which matches my last run. I was really happy with my results; I didn’t expect the same timings because I didn’t feel like I had went at the same pace. Overall, I’m really happy with how the run went. I’m very happy that my time stayed the same and I’m glad that I was able to push past the self doubt because that’s probably something that will always play on my mind (and it’s not something that happens when I’m just running either). It’s less than a week and a half to go now until the race, exciting! If you want to read about my introduction to this series, you’ll find it here and if you want to hear about my raw, emotional experience when running, you’ll find that post here. Thank you for reading the series so far, I can’t wait to share the rest of the journey with you!